What do college students need from a cookbook? With very little time and on a tight budget, they need easy, quick recipes, with easy-to-follow steps. That require minimum kitchen utensils and appliances - just a hot plate or a microwave. And use few, economical, easily available ingredients. Meals that are not costly, are easy and quick to prepare, and are healthy, tasty to eat. I present to you a hand-picked list of the best cookbooks, chosen to meet each of the above needs. Some of these cookbooks have been written by college students themselves. There are loads of recipes and varied tastes within, to help students make everything they crave. A cookbook written by college students, for college students. The recipes in this book are quick, easy-to-make, cheap, and healthy. Includes several vegetarian dishes as well. The recipes cater to varied tastes - lots of good hearty American fare, along with Chinese, Indian, and Italian. Has everything from breakfasts, salads, sandwiches to main dishes and desserts. Includes nutritional analysis of each recipe, advice on stocking a kitchen, and handy cooking tips. 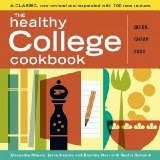 A good cookbook for the college student who lives in a dorm and has access to a kitchen or simple hot plate cooking. Written by a college student who learned to prepare food during his college years, this book is easy to relate to for students. Has a good collection of simple, easy to follow, inexpensive, delicious recipes for everything from breakfast, sandwiches, salads, soups, pastas, dinner entrees, roasted chicken, side dishes and vegetables, deserts, basic salad dressings, dips and spreads, sauces, and marinades. The cookbook has a section with helpful information such as how long it's safe to keep certain foods, how long to cook meats, the basics of what every kitchen should have in it, how to choose the kitchen utensils - appliances, what cooking terms like broiling - simmering - steaming - sautéing mean, basic insight into food shopping for beginners, and much more. A good beginners cookbook, it has more than 300 hassle-free, cheap, easy, and delicious dishes, to not only satisfy your hunger, but your meagre bank account too! Students will find ideas for everything they crave, and there is enough of a selection to keep them happy. Perfect for college kids and anyone on a budget as well. Meals in a mug are a convenient and budget-friendly way to eat delicious and healthy meals when living in a dorm. Great for making single meals and snacks, the individual portion sized recipes in this book cover morning breakfast to late afternoon snacks and satisfying suppers with just a quick trip to the microwave. These tasty and healthy dishes reintroduce the ease and simplicity of the microwave. And the handy nutritional analysis accompanying each recipe takes the guesswork out of planning healthy meals. The dishes take only a few minutes to prepare and cook. The ingredients aren't special foods or spices, and the recipes make one serving so you don't have left overs. Has more than 100 simple, healthy, delicious, and budget conscious recipes, made with affordable ingredients to cut your grocery bill in half, without sacrificing eating healthy and well. It also contains priceless cost-cutting tips and expert principles for saving in the kitchen. A great cookbook to help students eat well and not be limited by their budget. Has 142 great-tasting, cheap, quick, healthy, simple vegetarian recipes that use few, easy to find ingredients. The recipes are divided into breakfast, dips & spreads, soups & stews, salads & dressings, sandwiches, wraps & pizza, bean meals, grain meals, pasta, stir fries & potatoes, desserts & quick breads. A good cookbook for students who are vegetarian, or are on a tight budget. Good cookbook for preparing quick, filling, budget-friendly meals, allowing students to eat well without investing lots of time or money. Has easy to follow directions, and the inexpensive, easy-to-cook dishes are simple to customize for individual tastes. Ramen is one of the cheapest foods in the supermarket. This cookbook features 53 healthy recipes, that discard the flavor packet, and replace it with few simple ingredients to create fast, easy, cheap, and good microwave meals. With little cooking mess to clean up, and fast cooking time, the dishes are perfect for the dorm room. The cookbook also features many helpful tips on cooking and seasonings. Are you a college student living in a dorm? Need a break from the monotony of your meal plan? Can't afford to waste money on lukewarm takeout? Well, now with help from these hand-picked cookbooks, and access to a microwave or a simple hot plate, you can ditch the dining hall's soggy excuse for the Monday-night special. And switch to the nourishment and enjoyment of real food, food thats whole lot tastier and healthier than cup o noodles. There is more to life than takeaway food. Eating out, is costly and not always healthy. You can, with a modicum of effort, easily cook something good, tasty, and healthy. Are you a college student moving out of the dorm and into an apartment? Well this means no more meal plans. Its time to learn how to make flavorful, delicious, simple dishes so you don't starve or overdose on Ramen. These are hand-picked solid food guides, for those who are just realizing that they have to, in fact, learn to cook for themselves. Are you a college student living in an apartment? Do you want to get out of the rut of cooking the same thing every night. Have you spent years living on pasta because you didn't know how to cook anything else. Are you wasting much money on groceries and not making good meals. Instead of fueling your body and feeding your brain with ramen noodles, mac and cheese, and Totino's pizza rolls, its time to use this book-list to regularly fit healthy, more well-balanced meals into your days. These cookbooks make great graduation gifts. Great gifts for seniors in high school going off to college, for college bound grandson, for the granddaughter in college, for your teenage kid as a high school graduation gift, for the son getting his first apartment for his new school year, for the daughter who shares a condo near campus with other roommates, for nieces and nephews leaving for college. If you want them to eat right at their own dorm/apt. these cookbooks are the best, and a must. These cookbooks also make great birthday or holiday gift, for new cooks, for busy people and empty nesters, for a senior citizen who is slowing down in the area of preparing detailed dishes, for busy moms and anyone who didn't get cooking lessons at home as a kid, for those who have recently moved out for the first time, for people who have never cooked before, for people who are on a budget, for single people / bachelors, for office workers and travellers with cooking access. Go ahead, make good use of this list, and do share it with family and friends.